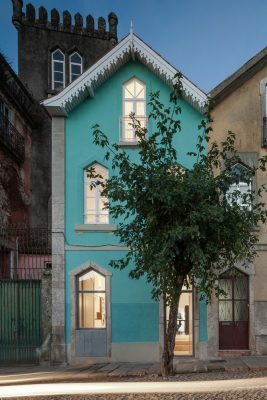 Conceived as an annex serving the small palace by its side and siting at the heart of both the roman and medieval walls of Braga, this is a particularly sunny building with two fronts, one facing the street at West and another one facing a delightful, qualified block interior plaza at East, enjoying natural light all day long. 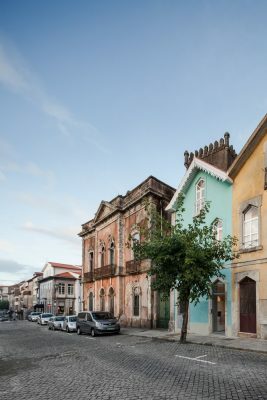 The building’s identity had been lost in 120 years of small unqualified interventions, over-compartmenting it, closing it to the street and to the light. Its façade was equally adulterated: modern aluminum window frames and exterior shade head boxes changed the openings’ stereotomy, the building’s scale and detail, and disrupted the original sense of the street. The façade was restored to its original glory, reinstating the original wooden window frames and preserving the delightfully decorated eave. 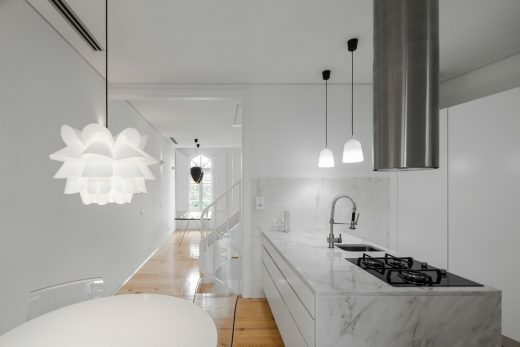 The interior recuperated the original spacial and functional distribution, wooden floors and ceiling structures and the original staircase, while introducing Portuguese Estremoz marble on the wet areas and ground-floor. 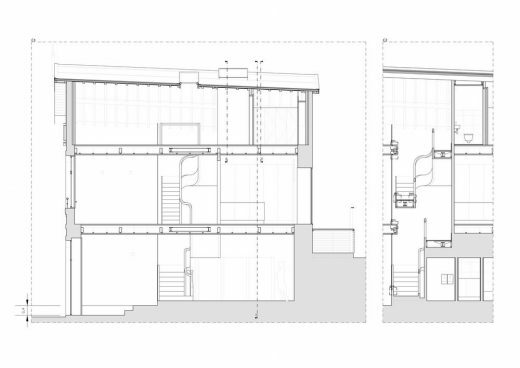 The program asked for the cohabitation of a work studio and a home program. 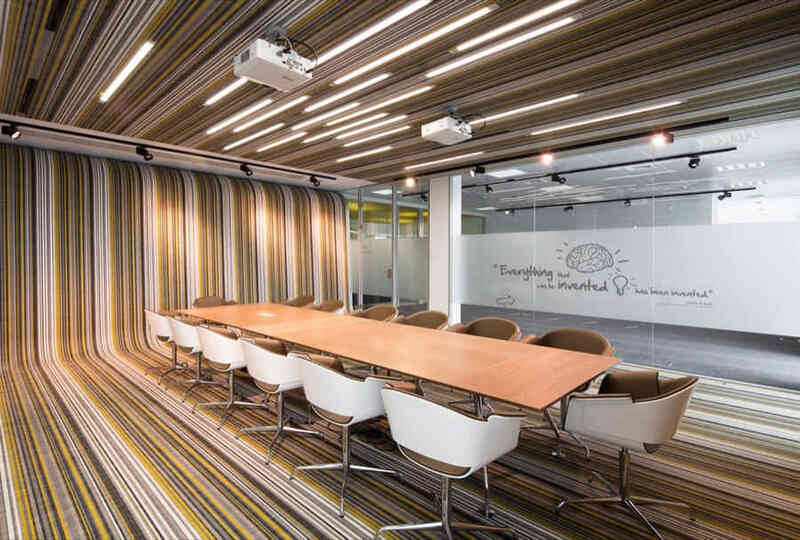 Given the reduced area of the building, the original strategy of hierarchizing spaces by floor was followed. The stairs are narrower with each flight of steps, informing the changing nature of the spaces it connects. 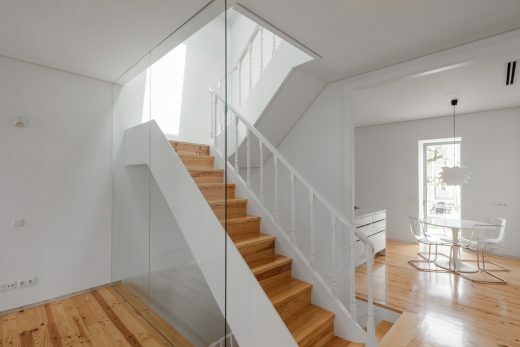 The staircase geometry efficiently filters the visual relations between both programs while still allowing for natural light to seep down from the upper levels. 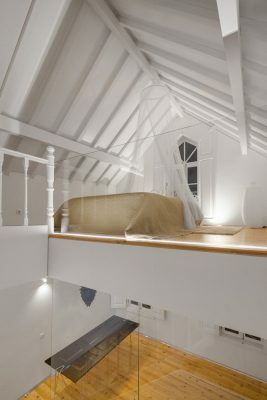 The first floor was kept for the social program of the house. 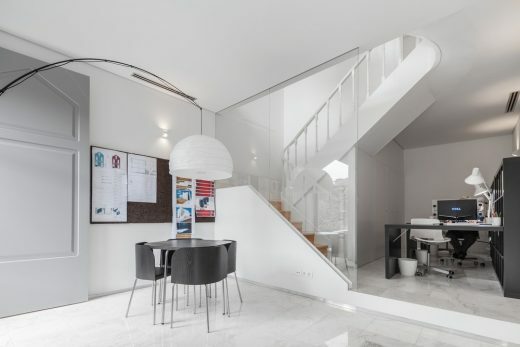 Refusing the natural tendency for compartmentalizing, the staircase was allowed to define the perimeters of the kitchen and living room, creating an open floor with natural light all day long. 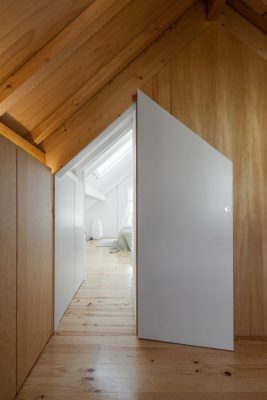 Light enters from the kitchen in the morning, from the staircase’s skylight and from the living room in the afternoon. 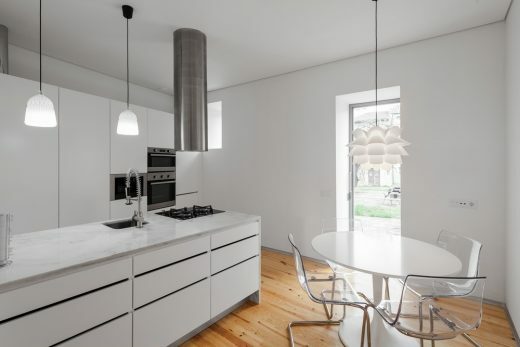 The white color is methodically repeated on walls, ceilings, carpentry and marble. The clothing room is the surprise at the top of the building. 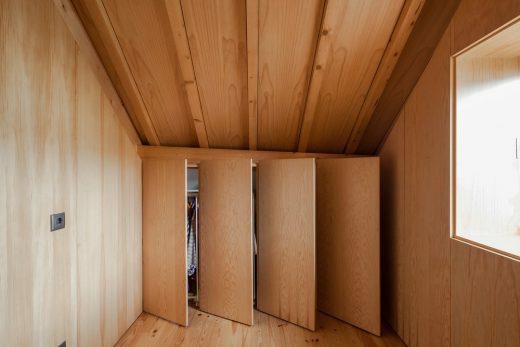 Both the floor and roof structure appear in their natural colors, surrounded by closet doors constructed in the same material. 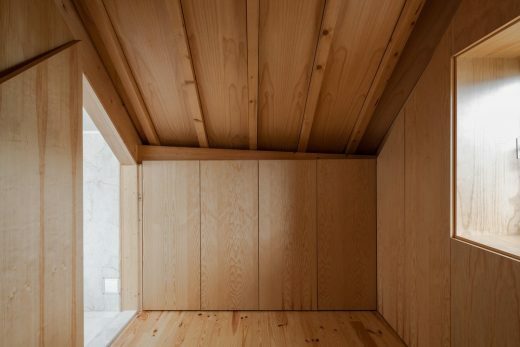 It reads as a small wooden box, a counterpoint to the home’s white box and to the marble box of the bathroom. 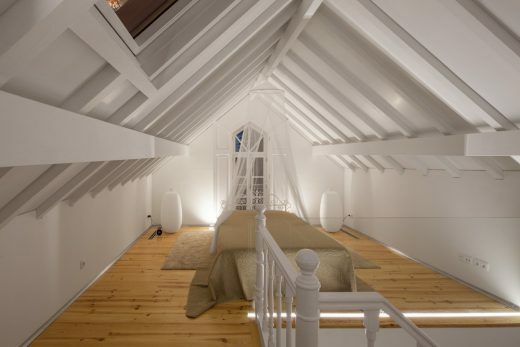 “At it most basic, our option was to reclaim the original intent and conditions of the building but with the (fundamental) subtlety of providing an added something beyond a blind restoration. 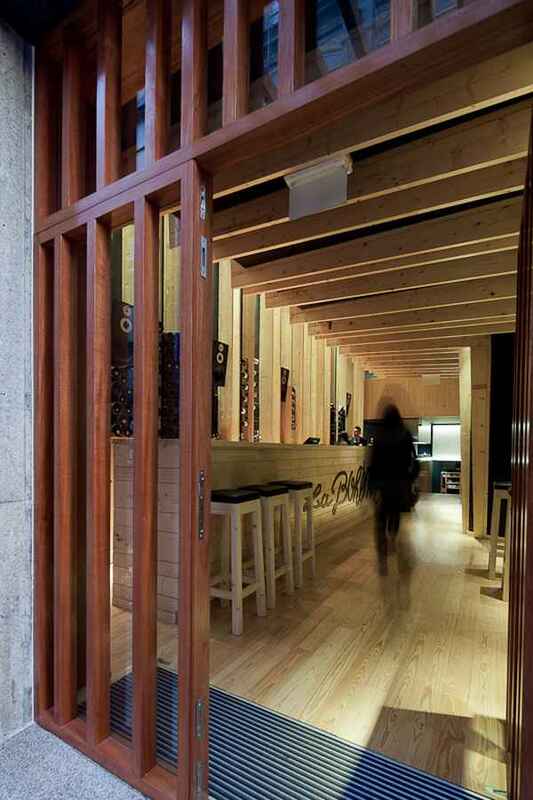 Something that could return the building to a function, to a use (whereby people could inhabit it and live a life of genuine quality), to present day, to the street, to the city, and with enough flexibility to keep it going for an extra 120 years. 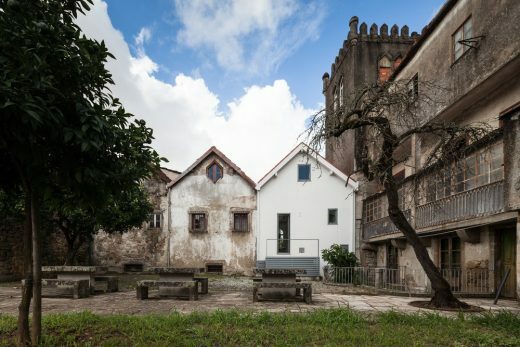 Curator of the “Mesturas II, International Architecture Encounters Galicia-Portugal” in 2016 (Portugal). 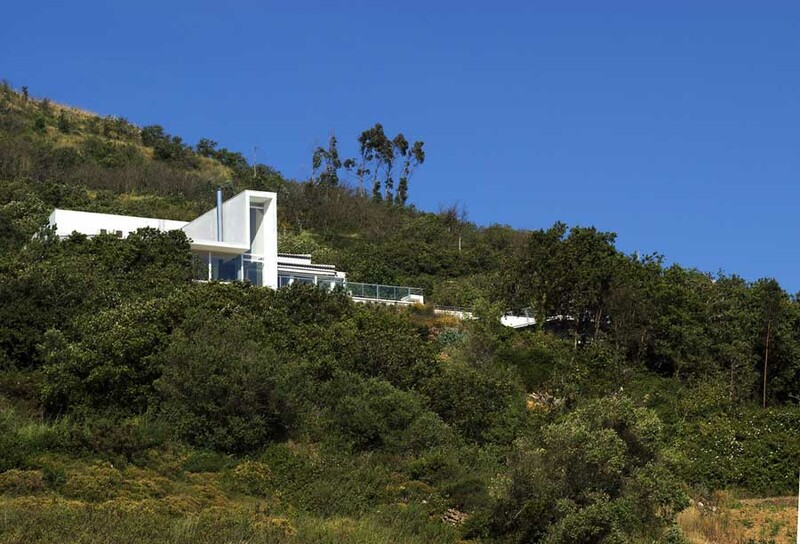 Curator of the “Mesturas, International Architecture Encounters Galicia-Portugal” in 2015 (Spain). Curator of the “urban Dialogues, International Architecture Congress” in 2014 (Portugal). 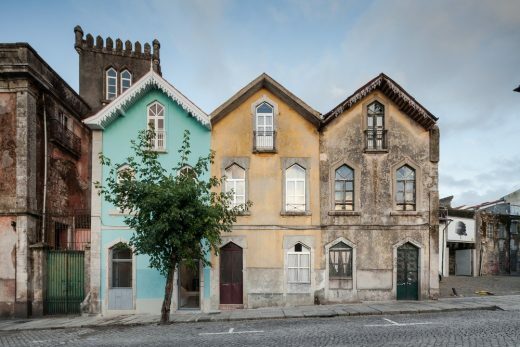 Published throughout the world, Tiago do Vale gives lectures on architecture, urban planning and rehabilitation. His work has been exhibited both in Portugal and abroad.